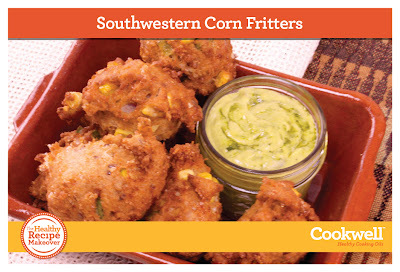 Southwestern Corn Fritters Recipe Redo! I grew up eating corn fritters. The greasy, crispy, sweet and savory treats are amazing to eat, but aren't necessarily the best thing for me. 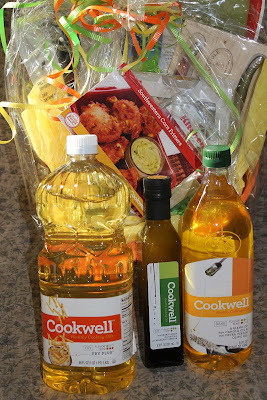 We recently teamed up with Cookwell Oils to have them makeover our traditional corn fritter recipe. The results were amazingly (and suprisingly) delicious. My family loved them, and my husband is now asking that I never make the originals again. 1. Mix flour, flax, spices, sugar, salt and baking powder together in a large bowl. 2. Mix cottage cheese, onion, poblano, eggs, water and honey together in a separate bowl. 3. Heat oil for frying in a sauce pan over medium heat. 4. 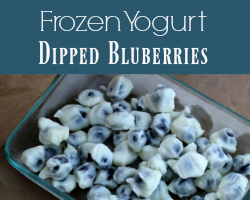 Fold together wet and dry ingredients with a spatula. 5. Drop mixture, 1 Tbsp. at a time carefully into oil, turning after golden brown on each side. Tip: To keep oil temperature stable, use a candy thermometer in oil. If you want fluffier, cakier fritters (like I grew up with), increase the water to 1/2 cup. I really appreciate Cookwell Oils working with me to give our recipe a redo. 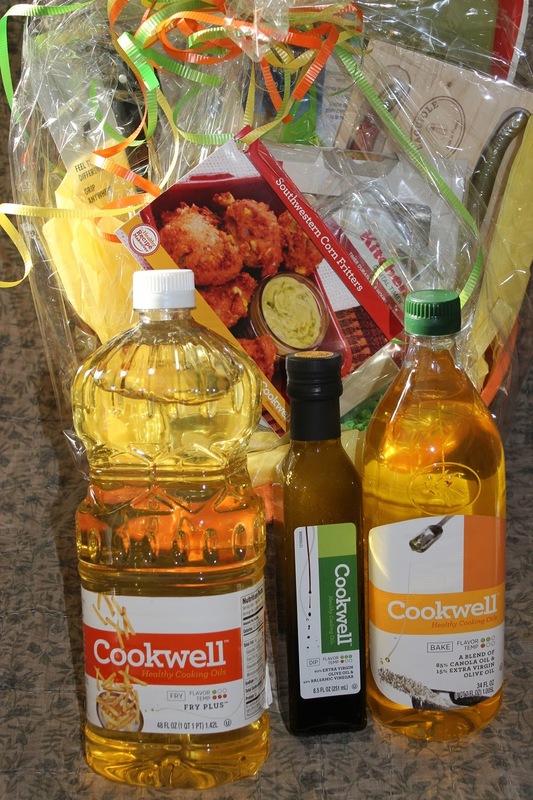 Not only did they send a cute gift basket full of cooking tools, recipes, and -- of course -- Cookwell Oils, they arranged for me to ask questions during a live chat with the chef who created my dish: Chef Jake Fisher! Cookwell has a variety of oils for every cooking need, including frying, baking, dipping and basting! Their oils are an alternative to regular cooking oils that make it easy to use high-quality, pure, healthy cooking oil. An excellent source of essential monounsaturated fats, Cookwell wants to help you select the best oil for the cooking method, so you can increase your intake of omega-3 fatty acids! 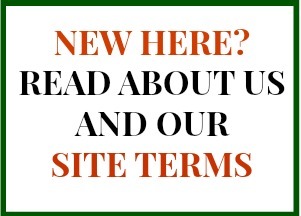 Find out which oils are best for your different kitchen tasks at their website! What recipe would you make-over, if you had the chance? 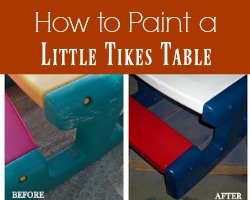 Looking for even more makeovers with Cookwell Oil? Check out these delicious dishes! *As a participant in the Walmart Moms Program, I've received product samples and compensation for my time and efforts in creating this post. All thoughts and opinions are my own.